We’re up to our sixth day with sick kids underfoot and the TV is getting a MAJOR workout. After endless episodes of X-Files, Doctor Who and Living With Boys I felt like lightening up. So I rented Galaxy Quest. It wasn’t quite as good as I remembered, and the seven year old was totally confused by the concept of actors playing actors on a TV show who are mistaken for space warriors by aliens and co-opted into leading their race into war, but it was still quite fun (for me). And it got me thinking about other movies I could show them that might raise a laugh. So I clicked on a few preview trailers and suddenly realised how dodgy the special effects were, how muddy the colours seemed and how … dated comedy can become. I dare you to watch the short for Caddyshack and not go WTF? It reminds me of being a teen and laughing until I cried over The Young Ones, then viewing it as an adult and thinking … hmmmm, what was so funny again? MONTY PYTHON AND THE HOLY GRAIL (1975) The inventive British sketch comedians (John Cleese, Graham Chapman, Terry Gilliam, Terry Jones, Michael Palin, Eric Idle) do battle with the Arthurian legend, complete with a Trojan Rabbit and a Holy Hand Grenade. Tradition loses. We win. PLANES, TRAINS AND AUTOMOBILES (1987) A tired businessman (Steve Martin) tries desperately to get home. Nobody listens, except a lumpish, insensitive passer-by (John Candy.) Disaster follows. The cast plays it for reality as well as laughs, thanks to director John Hughes. GROUNDHOG DAY (1993) Egomaniacal weatherman Bill Murray spends a night in Punxsutawney, Pa., where the local groundhog is supposed to see his shadow and predict how long winter will last. Trouble is, Murray gets caught in a time trap, and keeps repeating the day, minute by minute, day after day. Scrooge becomes saint, but not before some funny and wise interludes, supervised by director Harold Ramis. FOUR WEDDINGS AND A FUNERAL (1994) Blithe British comedy about a young man (Hugh Grant) who can’t commit until he meets an unattainable woman (Andie MacDowell). With a choice supporting cast, under Mike Newell’s direction. THERE’S SOMETHING ABOUT MARY (1998) Indeed there is, as played by Cameron Diaz, and Ben Stiller has craved it since high school. Now that she’s a lady every other man does, too. Sophomoric? Yes. Hilarious? Absolutely. Matt Dillon helps. A few I’d add: Dirty Rotten Scoundrels (Ruprecht and his fork is THE BEST) and Life of Brian. Any suggestions for other movies that are guaranteed to put a smile on someone’s dial? Anchorman. Always Anchorman. I love lamp. You must be hanging out for the sequel. I loved ‘Gods Must Be Crazy’, and the Australian movie ‘The road to Nhill’. The movies that are probably not to everyone’s taste, but I still think they are two of the funniest movies ever. We love a good Aussie movie at our place, I will definitely look that one up. A friend has been showing her kids (12 and 9 yo girls) the Back to the Future trilogy – they loved Michael J Fox – and Ghostbusters. I thought they’d find these 80s treasures lame compared to today’s offerings but they have had fun And the ghost-averse 9yo was a bit spooked by Ghostbusters. I keep mentioning Back To The Future, but my husband reckons it would have dated too much, so it’s good to hear they might love it. Thx for letting me know Kay. 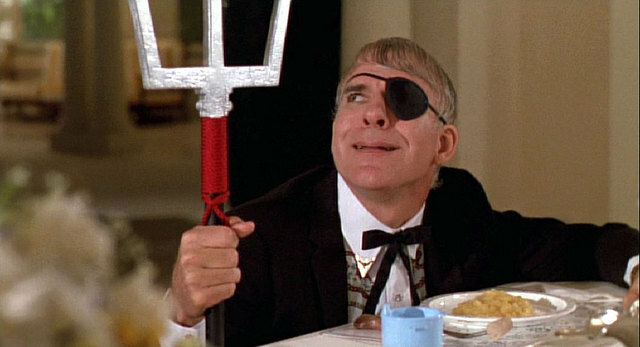 I like Parenthood, another Steve Martin gem. It makes me laugh and makes me feel less alone in my domestic chaos. Oooh, I’d forgotten Parenthood. Steve Martin is brilliant. Have you seen him doing duelling banjos with Kermit? That’s in my gossip column today.